From newspaper ads, TV broadcasts, and numerous posters at MRT train stations, on buses and along highways, the people of Formosa got the news that Supreme Master Ching Hai, who had been absent from the island for quite some time, would be returning soon to deliver a lecture. The native Formosan people also spread the word: "Master Ching Hai is coming back!" Phone calls flooded our contact offices. The lecture was scheduled to start at 7:00 PM, but eager visitors from all around Formosa began to pour in from early in the morning, and the Taoyuan County Stadium was soon brimming with fervor. Before the lecture, Formosa's major media reported the news of Master's upcoming lecture, and affirmed that the Miaoli Hsihu Center's legal problems had been formally resolved. 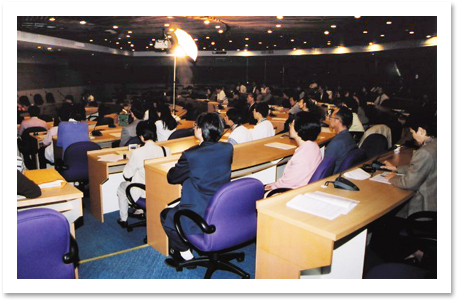 Eastern Television, or better known as ETTV, covered the entire lecture, broadcasting it live to Formosa and North America. ETTV making a live broadcast of the whole lecture. The zealous attitude of fellow practitioners from all parts of Formosa who volunteered to prepare for the lecture touched the hearts of observers. A fellow practitioner from the United States said, "Words cannot fully describe the loving attention that Formosan disciples paid to the countless details of this lecture. 'Divine' is truly the best choice of words." The Taoyuan County Stadium is a huge indoor stadium with a seating capacity of 20,000, and fellow practitioners took meticulous care of each elaborate detail in its decoration. 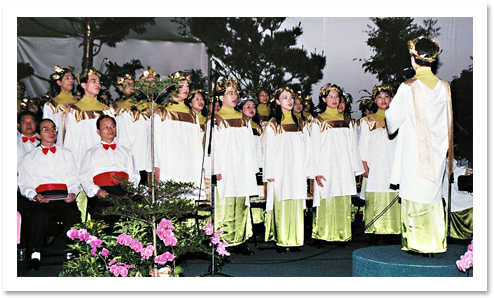 After the lecture preparations were completed, the stadium's stage was transformed into a fairyland like those found in Chinese myths, with a waterfall in the background, ethereal clouds above the stage, and surrounded by orchids, green grass and trees. 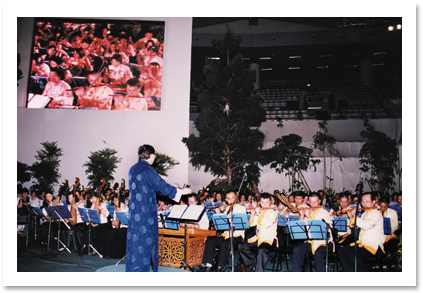 In addition, two gigantic TV walls were set up in the lecture hall, so that the audience could see Master clearly. Reporters and vehicles from the major media covering the lecture event. A crowd, consisting of people of all ages, began pouring into the hall at 4:00 PM. The visitors moved around the lobby, enjoying the beautiful display of Celestial Clothes and Jewelry and Master's paintings and publications, or sat in the stadium to listen to Chinese music performances and choral singing. By seven, not only were the seats and several thousand additional ones fully occupied; even the stadium passageways were fully packed with guests. In the corridors outside, many people sat watching a live broadcast of the lecture on TV or huge projection screens. Another crowded place was the registration counter for those who wished to receive initiation or learn the Convenient Method. The intense longing of these Truth aspirants was very obvious. Beginning at seven o'clock, several fellow initiates recounted personal spiritual experiences, and Chinese music and choral singing performances were presented. Then, everyone waited eagerly as Master appeared, wearing a white outfit with colorful floral patterns. She looked like a gorgeous summer flower amid the zealous crowd. Since She had not visited Formosa for a long time, She immediately felt the intense emotions of people who had missed Her, and so, upon entering the stadium, She walked around the venue, greeting everyone in every corner. All the audience members rose to their feet and waved to Master, and of course, tried their best to get a handshake from Her. 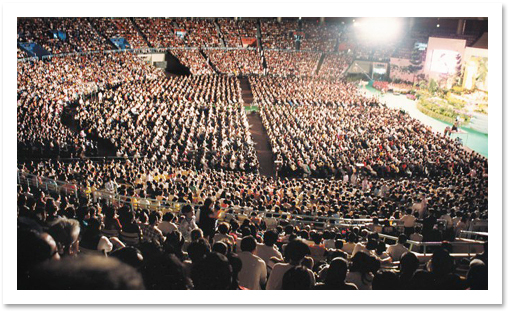 Tens of thousands of people flock to Supreme Master Ching Hai's lecture at the Taoyuan County Stadium. Before Her lecture, Master, with eyes closed, led the audience in a sincere prayer for peace in Formosa, mainland China, and the rest of the world. She thanked the large numbers of Buddhas who came to see Her. Although not everyone knew that they were Buddhas, She saw the Buddha in everyone. She said. "We are all one. We are the same. Each one of us is like a drop of water in the ocean. Although every drop is individual and special in its own way, it is still the ocean. If we want to know rather than just hear others say that we are all one, it is not so difficult. We only have to approach it from the other side. If we listen inward to our Self-Nature, we will immediately see our God Nature. We have all read about "listening inwardly to our Self- Nature" in the Buddhist scriptures, but we don't know how to do it. Why do we need to 'listen inwardly', and not 'look inwardly,' 'touch inwardly,' or 'feel inwardly'? This is because it is really possible to listen to our True Self. We do not listen to It with our hearing faculty; we listen with our inner heart. We can really listen. Why do we say listen? It is because there will be heavenly music, Buddhist sutras, heavenly teachings, and the inner Sound current that is as beautiful as music, but no musical instruments are needed to produce It." "No musical instruments are needed to produce this sound that is so beautiful and mystical that it makes our souls soar in bliss and happiness back to our original Home, like the Buddha Land or heaven. This is why the Buddha said that we should 'listen inwardly to our Self Nature.' Our Self Nature is not our 'heart' nor a 'quality.' It is free and easy, very, very wise, noble, great, and encompassing the whole universe. This is our Self -Nature." In Her usual, humorous way, Master elaborated in simple language on the nature of the Divine Realm, and Her speech was greeted frequently by loud applause. "The Bible states, 'Seek ye first the kingdom of God, and then everything shall be added unto you,' Shakyamuni Buddha also said that when we have found our God Nature, even our life as a human being is happier, more successful, and more abundant in material terms. The purpose for finding the God Nature is not to get a more comfortable life, but after finding our God Nature, we become happier and more comfortable because, upon finding our Buddha Nature, everything is illuminated. All of our previously forgotten talents, our dormant wisdom, and our overlooked abilities develop with our God Nature. We become a different person, because from that moment on, we are no longer humans; in fact, we are not human in the first place. It is only after entering this body that we call ourselves humans. So, who are we before we enter this body? Also, who will we be after we have departed from this body?" "Shakyamuni Buddha said that He and we are equal, that He attained Buddhahood and so will we in the future. He also said that all sentient beings have God Nature like He did; then why are we not aware of It? He asked Himself this also. It is because the illusions of this world are really alluring; therefore, we absolutely cannot remember who we are, we forget about our homeland in heaven, and we forget about the Buddha Land. However, it is also very simple if we choose to remember. It is as easy as turning over one's palm. It is simple, but also not simple. It is not simple because we are used to looking outside, so it is difficult for us to believe that we are God. We might have heard about heaven, the Buddha Land, and that the Buddha is in the heart or that God is within us. However, hearing it is one thing, but the next day we are still busy living the life of an ordinary human. When we die without a guide to lead us, we won't know where to go, and our soul will be in agony." "If all of us would have found the heavenly Kingdom within, this world would have become nirvana long ago. The Zen doctrines say that only a strand of hair separates heaven and Earth. It's truly like that. We originally came from heaven, so we only have to revert our attention and listen inwardly to our Self Nature to find heaven." In the middle of Her lecture, Master said that those who wanted to learn the Quan Yin Method could go outside to register. Then, there was a lot of movement in the venue, and many people went to the registration counters. More than a thousand people received initiation or learned the Convenient Method. 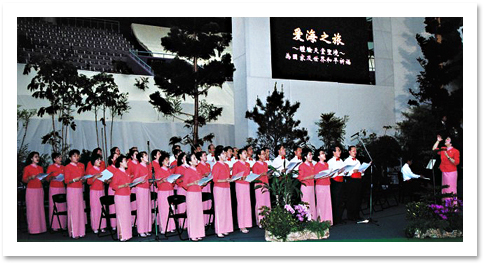 For several days after Master's lecture, the "Ocean of Love Tour" hot line continuously received calls from every part of Formosa. Callers expressed their interest in learning more about Master's teachings and the Quan Yin Method. Some earnestly requested initiation or to learn the Convenient Method since they had missed the chance on the day of the lecture due to other engagements. Supreme Master Ching Hai pariticipating in a Seminar hosted by Academia Sinica. From 10:00 AM to 12:00 PM, Master attended a seminar entitled "The Supreme Master Ching Hai, the Quan Yin Method, and the Chinese in Southeast Asia," held at Academia Sinica in Taipei. Although Master's itinerary was very tight for Her lecture tour in Asia and Oceania, She still attended the seminar, which was one of a series discussing the relationship between various religions and Chinese people around the world. Academia Sinica is a world-renowned organization involved in academic research. The organizers of the seminar were members of the Southeast Asia Research Project from Academia Sinica, the Taiwan Religious Institute, Formosa's Central Broadcasting Corporation, the Overseas Chinese Research Group of the Contemporary History Research Faculty from Academia Sinica, and the Chinese Interdisciplinary Association. Participants in the seminar included professors from Formosan universities, research fellows and associates from Academia Sinica, media professionals, and other elite personnel from many fields. After the seminar, the hosts followed their usual practice and presented a lecture honorarium to Master, Who was very touched by their sincerity. This was the first time in over a decade that She had been awarded compensation for a discourse. Master returned the money to them immediately, as a gift to help with the expenses of the seminar. Lasting two hours, the seminar was warm and interesting, and especially meaningful in regard to Asian academic research. 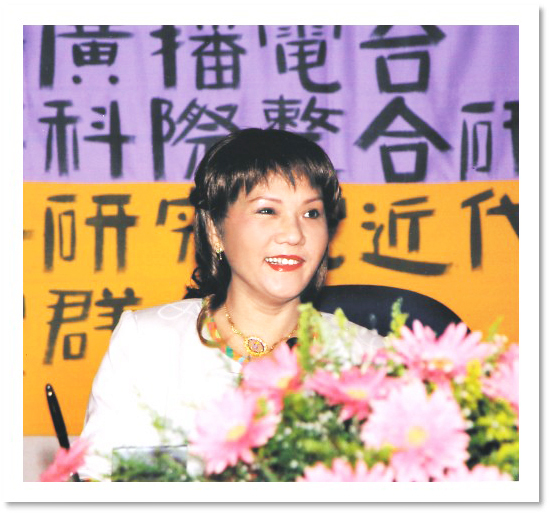 All the major newspapers in Formosa prominently reported the news about Master's lecture at the Taoyuan County Stadium, as well as Her seminar at Academia Sinica.